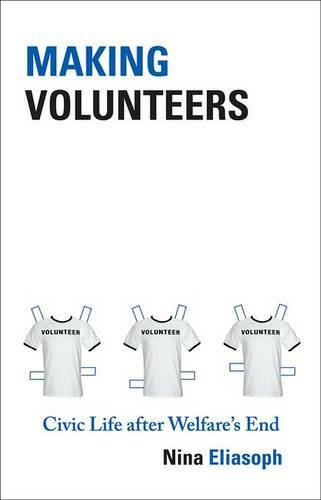 Volunteering improves inner character, builds community, cures poverty, and prevents crime. We've all heard this kind of empowerment talk from nonprofit and government-sponsored civic programs. But what do these programs really accomplish? In Making Volunteers, Nina Eliasoph offers an in-depth, humorous, wrenching, and at times uplifting look inside youth and adult civic programs. She reveals an urgent need for policy reforms in order to improve these organizations and shows that while volunteers learn important lessons, they are not always the lessons that empowerment programs aim to teach. With short-term funding and a dizzy mix of mandates from multiple sponsors, community programs develop a complex web of intimacy, governance, and civic life. Eliasoph describes the at-risk youth served by such programs, the college-bound volunteers who hope to feel selfless inspiration and plump up their resumes, and what happens when the two groups are expected to bond instantly through short-term projects. She looks at adult "plug-in" volunteers who, working in after-school programs and limited by time, hope to become like beloved aunties to youth. Eliasoph indicates that adult volunteers can provide grassroots support but they can also undermine the family-like warmth created by paid organizers. Exploring contradictions between the democratic rhetoric of empowerment programs and the bureaucratic hurdles that volunteers learn to navigate, the book demonstrates that empowerment projects work best with less precarious funding, more careful planning, and mandatory training, reflection, and long-term commitments from volunteers. Based on participant research inside civic and community organizations, Making Volunteers illustrates what these programs can and cannot achieve, and how to make them more effective.